Continuing the exploration started by our Sun Ra Mixtape Series celebrating the influence of the Philadelphia, visionary musician, philosopher, composer and band leader, Sun Ra, Philadelphia Jazz Project present, Satellites Are Spinning: A Sizzling, Sonic Celebration of Sun Ra. This concert series features 8 performances at some of the region's most important venues including; The Barnes Foundation, Ardmore Music Hall, Johnny Brenda's, The Planetarium of The Franklin Institute and World Cafe Live. Hosted by WRTI radio deejay, J. Michael Harrison. The music featured in the concert series will include magical moments of Straight Ahead & Avant-Garde Jazz, Sun Ra classics, Vocals, Poetry, Funk, Hiphop, Rock and more. Project consultant for the entire Satellites series and music director for Satellites concert #2 and is guitarist, composer, producer and former architect, David Middleton aka DM Hotep. 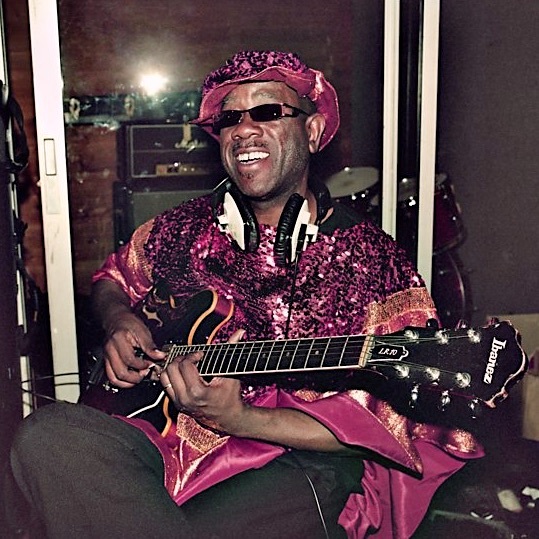 He has worked with many Philly-area musicians including, DJ Tat Money, Philia Jazz Composers Forum, Robert Kenyatta's, La Tumba, Sonic Liberation Front, Mogauwane Mahloele's, Tharo and JazGuardian. 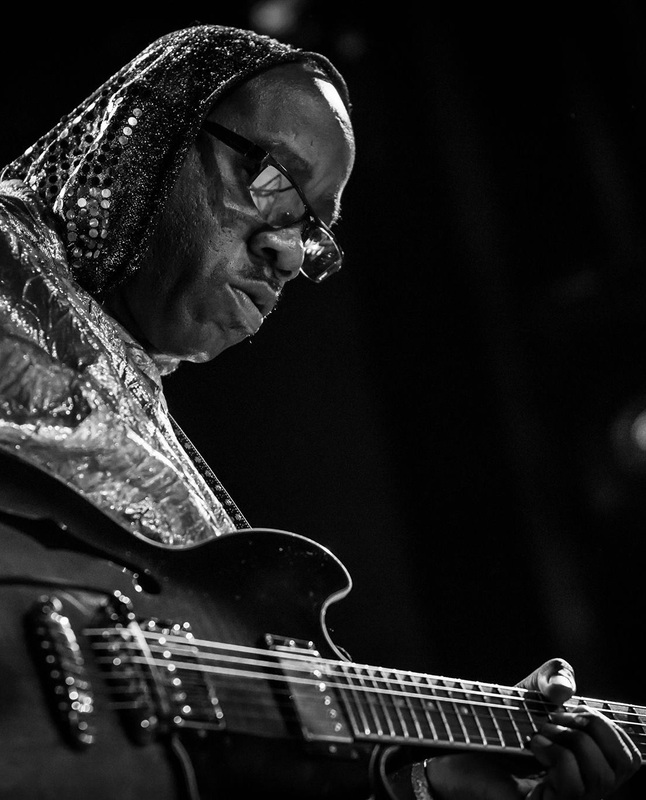 Since 2000, he has been a member of the Sun Ra Arkeatra, under the direction of Marshall Allen. DM Hotep continues his exploration of electronic & untempored music with his own Akimbo Research Project. 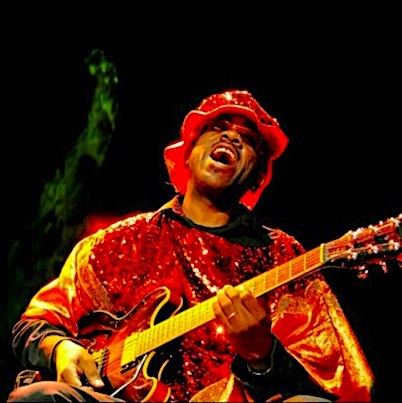 PJP spoke with guitarist, producer and composer David Middleton aka DM Hotep who will serve as musical director for the second concert of the Satellites Are Spinning Concert Series. DM Hotep: Outward; from the inside. You begin with what you know, what they taught you; then you find ways to play what you don't know, or compose what you don't think exists, fearlessly. Using sound to create music to interpret emotion -- not just visa versa. All genres are available, all technologies relevant, in all combinations. Why would they not be? DM Hotep: There are so many influences that affect my musical pallet that it is almost impossible to begin a list that wouldn't erroneously suggest a weighted preference. Of course, there were certain artists that introduced me to other genres, idioms, & artists, (Miles, Benson, Floyd, Metheny, Glass, WXPN, WRTI, Timberland...); but I could also begin with pop and R&B music icons from the 1960s forward, or any jazz from the last half of last century,... However, since I've spent the last 17 years working under Marshall Allen's direction in the Sun Ra Arkestra, that influence is rather obvious. DM Hotep: "Jazz" has allowed me to explore some of the more complex harmonic and rhythmic possibilities in music, all while keeping available the possibility of joyous improvisation and unscripted interplay. It takes the basics of any folk musics and allows musicians to explore everything else. It's my "day job", but it's not the only explorations that I limit myself to. DM Hotep: The Sun Ra Mixtape Series was an inspired concept that sought to combine the DIY artistic spirit, use of the most current technologies and the current aspirational ascension of this "Afro-futurist" ideal, to explore & celebrate the historical influence of one of the earliest proponents of all of these -- Sun Ra. PJP: Tell us about the Satellites series. What are you planning to present at the AMH? 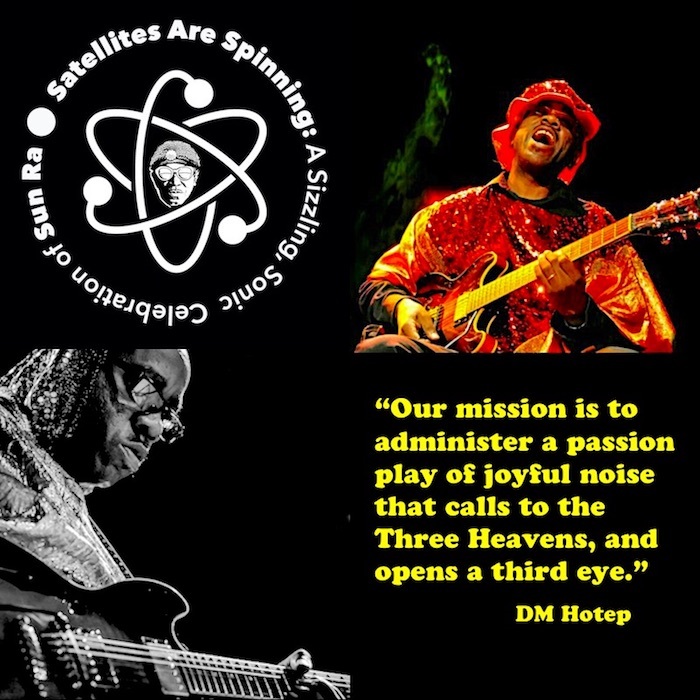 DM Hotep: The Satellite Concert Series brings to life what only exists on your streaming device right now -- The Sun Ra Mixtape Series. You should check it out. We will take what was suggested to us to use, and try to manipulate it in a way that challenges your expectation of what was musical about the sounds of yesterday, for tomorrow's world. Connect it to some of Sunny's [Sun Ra's] precepts, or other futurist environments. All in full color, in front of your living eyes and ears. If you've heard the latest news from Neptune, then you know what to expect. DM Hotep: Yesterday's future has been realized: it is today. You are literally living in a yesterday's future, today. I'm more concerned with the sound of tomorrow's future, which is a destiny altered by today. This concert series will show you the impact of yesterday on today, and hopefully suggest an alter destiny for tomorrow. Some tomorrow's tommorrow awaits birds with wings, because birds without wings think flying is crazy. DM Hotep: A very relaxed and open group of Philadelphia-area musicians who can not-only recreate and interpret the sounds of the past that you are well familiar with, but who can also explore the possibilities of infinite combinations. We have both a choir of vocalists and a choir of brass instruments to accompany our traditional rhythm section, plus a couple of poets to speak power to truth. Specifically: vocalists - Saudah Al Akbar, Alexa Gold, Tara Middleton, & Bethlehem Roberson; poets - Bernard Collins & Ram Riches; trombonists - Dan Blacksberg, Connor Przybyszewski & Frank Rein; and a rhythm section of Kimpedro Rodriguez, Jocko MacNelly, V. Shane Frederick & myself. DM Hotep: Suspend your expectations of musical reverie; although there will be moments of that. Our mission is to ad-minister a passion play of joyful noise that calls to the Three Heavens, and opens a third eye -- even if we have to mesmerize you to awaken your realization of future para-dig'ms that includes YOU and YOUR aspirations.